CMMG’s MkW-15 XLR2, chambered to 6.5mm Grendel, is larger than an AR-15 but smaller than an AR-10. Its an overbuilt gun with strength to spare. While the 6.5mm Grendel was officially introduced back in 2004, it really took off in 2017. There were a couple reasons for its sudden surge in popularity. Being a 6.5mm, it rode the coattails of the 6.5 Creedmoor in its meteoric rise. Plus, the availability of economical steel case ammunition led many riflemen to consider it. Of course, the cartridge’s relatively impressive performance, considering its size and case capacity, caught the attention of many. This all led to an explosion of interest in the 6.5mm Grendel, and industry responded with a host of offerings. One particularly interesting new model chambered in 6.5mm Grendel is CMMG’s MkW-15 XLR2. What sets this rifle apart from the AR crowd is the simple fact it is not an AR-15. Nor is it an AR-10. Instead, the MkW-15 XLR2 is a horse of a different color. It’s smaller than an AR-10 but larger than an AR-15. Built on CMMG’s MkW Anvil platform, the company refers to it as a midsize design. What makes this model stand out is that it combines an AR-10-size bolt with the small magazine well of the AR-15. 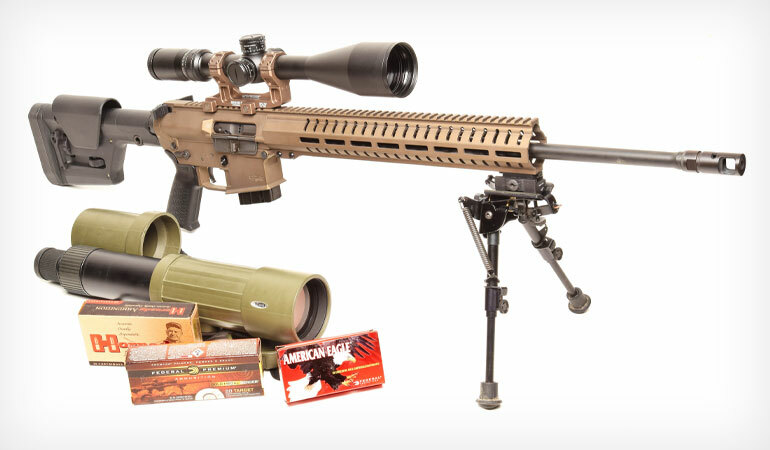 The result is an extremely rugged rifle capable of handling anything the 6.5mm Grendel can throw at it—and then some. The MkW-15 XLR2 is built using a heavy-walled upper billet receiver machined from 7075 T-6 aluminum. This provides a robust foundation on which to mount the match barrel. The upper is a traditional flattop design, featuring a brass deflector and ejector port door, but there is no forward assist. Riding inside the upper is a beefy bolt carrier assembly based upon CMMG’s .308 Win. Mk3 series. When I say it’s beefy, I’m not exaggerating. The bolt dwarfs a standard AR-15 6.5mm Grendel bolt when the two are placed next to each other. As such, it is overbuilt with strength to spare. While the machined bolt carrier is noticeably bigger and heavier than an AR-15’s, it is smaller and lighter than a standard AR-10 carrier. 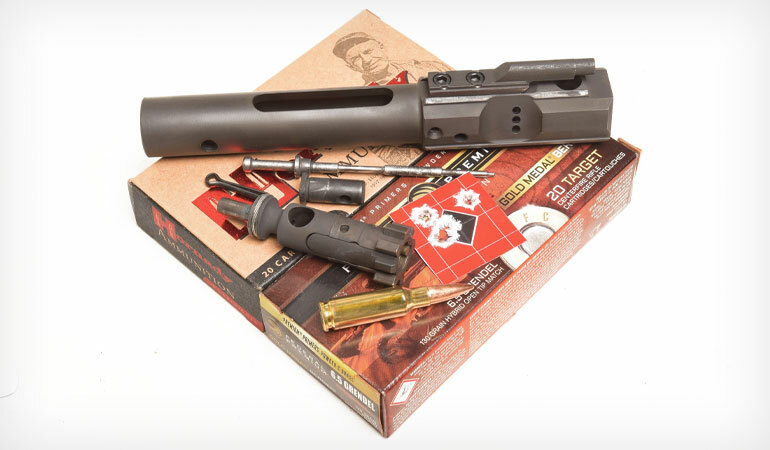 The heavy bolt carrier assembly works in conjunction with a specially marked buffer. This weighs 3.9 ounces, or about the same as an AR-15 H1 buffer. So there is quite a bit of reciprocating mass compared to a standard AR-15. Fitted to the front of the receiver is a 22-inch medium-taper barrel machined from 416 stainless steel. Rifling twist is 1:8, allowing a wide range of bullet weights to be fired. The rifle has a rifle-length gas system along with a low-profile gas block. Threaded to the muzzle is one of CMMG’s SV muzzle brakes. A single-chamber two-baffle design with two ports on top, it reduces felt recoil and muzzle movement. If you prefer a different design, CMMG cuts the muzzle with standard 5/8x24 threads, so you can easily install a different model. While the 6.5mm Grendel doesn’t need an AR-10-size bolt, CMMG’s decision to go that route means you’ll get longer bolt life and a greater safety margin for handloaders. Surrounding the barrel is CMMG’s RML15 free-floating aluminum handguard. This features a Picatinny rail at 12 o’clock and M-Lok slots at three, six and nine o’clock for mounting accessories, such as a bipod. The handguard is slotted to reduce weight, but it’s still quite robust. Furniture consists of an adjustable Magpul PRS stock and an MOE pistol grip. The stock’s length of pull can be easily adjusted, as can the comb height. The rifle includes a couple nice touches—like an ambidextrous charging handle and an ambidextrous safety lever, so you can shoot the rifle from either shoulder. And if you poke inside the billet lower receiver, you’ll find a Geissele SSA trigger group. This provides a clean 4.5-pound break and a short reset. My review rifle featured CMMG’s optional Cerakote flat dark earth finish, one of 11 different Cerakote finishes offered. Back to that overbuilt bolt. Why would you need one when the 6.5mm Grendel was specifically designed to work within the confines and pressure limitations of the AR-15? The benefit is that with factory ammunition you’ll see longer bolt life. I’ve been shooting the 6.5mm Grendel since before it was officially released and have never broken a bolt—even with heavy handloads—but some worry about it. But what the MkW-15 XLR2 really brings to the table is a greater safety margin for the handloader who is intent on pushing the 6.5mm Grendel cartridge to its maximum potential. For this scenario, though, I would prefer a longer 24- or 25-inch barrel to the 22-inch barrel to maximize velocity gains. Why push a 6.5mm Grendel with heavy handloads rather than simply stepping up in performance to a 6.5 Creedmoor or .260 Rem.? There are a couple reasons, depending upon the ranges you are shooting at and what you are trying to accomplish. The first is weight and bulk. CMMG’s midsize MkW-15 XLR2 is a bit lighter and handier than an AR-10, so it’s easier to maneuver and faster to get in and out of position. It’s also easier to shoot from position. Second is cost; the 6.5mm Grendel is less expensive to reload for than the larger 6.5mms. The third is performance. A heavy-loaded 6.5mm Grendel will perform very well out to about 800 yards and acceptably well to 1,000 yards if you can stay on top of the wind. You can indeed shoot to 1,200 yards with it, but it’s not ideal. Keep in mind you can push the Grendel only so far. Safe handloading practices must always be adhered to. The cartridge case was designed for specific pressure levels, and the cartridge has limited case capacity. Long, heavy, high-BC projectiles have to be seated deeply due to magazine length restrictions. Load them hot and you will greatly reduce case life. Always remember: Safety first. The MkW-15 XLR2 performed well on the range. I topped it with a Sightmark Citadel 5-30x56mm scope in a Geissele mount and fed it three different factory loads and one handload. Cartridges chambered smoothly, the trigger is very good, and recoil is quite mild. It’s a very smooth shooting piece off the bipod or from position. Reliability was 100 percent, but Federal’s 130-grain Berger Gold Medal Match load ejected only about two feet. It seemed to want something a bit hotter, so I tried a heavy handload using H335, Tula Small Rifle primers, Lapua brass and Hornady 100-grain softpoints. This functioned nicely, clocked 2,906 fps and averaged 0.7 inch at 100 yards. It would be a dandy coyote load. Returning to Federal’s 130-grain Berger Gold Medal Match load, I was able to make consistent hits on a 12-inch plate and frequent hits on an eight-inch plate at 800 yards. CMMG’s MkW-15 XLR2 is an interesting design. It’s a great-looking rifle and is nicely made. It shot well and proved reliable. Plus, it provides a nice safety buffer for careful handloading, although, frankly, if you need the performance of a 6.5 Creedmoor or .260 Rem., you should buy a rifle so chambered. The big downside to the MkW-15 XLR2 is simply its price. Suggested retail is $2,300, and that’s in basic black and not the Cerakote finish.